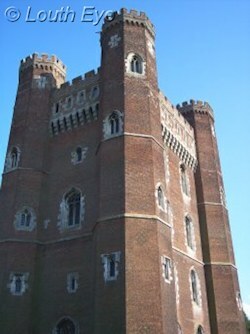 Tattershall Castle is a tall red-brick castle that dates mainly from the 15th century. There has been a castle on the site since 1231, when Robert de Tateshale built the first defences there. You can still see the foundations of the original castle in the grounds. 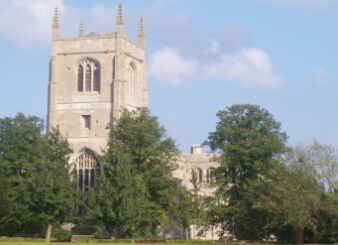 Ralph Cromwell begun his castle in 1433, and completed it 15 years later. This is the tower that you can see now. There are around 150 steps to reach the top, around a spiral staircase. Fortunately this staircase is fairly wide, so it's not too daunting to climb unless you suffer from very severe vertigo. Ralph Cromwell fought at Agincourt, and became the Lord Treasurer of England in 1433. There are various purse motifs to find dotted around the castle to symbolise his status. 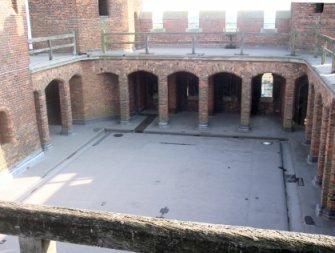 The basement rooms were used for storage, or as a servants' hall. As you go up the tower the rooms gradually become grander and more stately. The castle was built to be lived in, as much as it was built for defence. We have Lord Curzon of Kedleston to thank for the current state of the castle. He undertook restoration work in the early 20th century, and bequeathed it to the National Trust on his death in 1925. 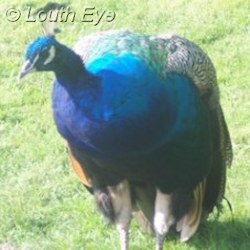 Peacocks live in the castle grounds, which is now owned by the National Trust. No dogs are allowed. Tattershall is a village in central Lincolnshire, near to Woodhall Spa and Coningsby. It is close to several lakes, and the river Bain runs through it. The village is perhaps best known for its castle. The castle is a large red-brick building surrounded by a moat and the remains of various other outbuildings. The battlements are pictured on the left. 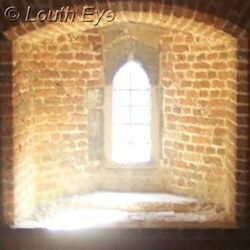 The Holy Trinity church is right next to Tattershall castle, and is also worth a visit. 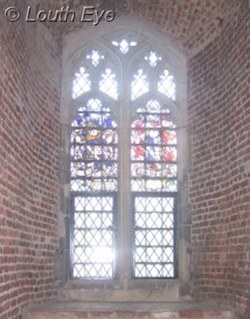 It contains a plaque marking the grave of Tom Thumb, a Tattershall resident of the 16th and 17th centuries who grew to just 47cm tall. Like the castle, it was also built by Lord Cromwell in the 15th century.